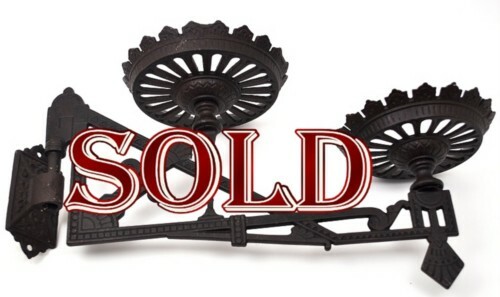 This is one of the nicest old vintage sconce brackets Andtiques.com has ever offered. An Excellent Quality Antique with no rust. Cast Iron Metal and quite heavy. Design: Very Ornate and Intricate Details Clearly in Excellent Shape with no breaks or cracks that we can find. The bracket fits quite easily and swivels just fine. Great Condition Sconce at a Andtiques Price! Please contact us for any further information, description, or photographs of this piece you may need. IMPORTANT SHIPPING NOTE: We never overcharge for shipping and never have. Shipping costs are calculated to the furthermost part of the Continental United States from us. Your shipping cost may well be less than the price showing in the listing. If shipping costs are less than you paid you will receive an immediate refund for what you overpaid. Our shipping costs include Delivery Confirmation so you may track your purchase.